Sometimes it’s the simple things that make you smile. As much of a product of the digital gaming age as I am, I still love a good game of chess. Yes, Windows has a built-in 3D chess game, but I’ll admit – I never passed much beyond the beginner aspects of the age-old strategy game so the Windows version is a bit advanced for me. When browsing the Chrome Web Store, looking for some nice extensions to try and review for all of you, I stumbled upon SparkChess, which boasts a full 3D, HD chess game right in your browser. Well, of course I installed it. The game lets you choose from 3 potential AI opponents, as well as having the multiplayer capacity to search for others real people using the extension and pit you against them. I chose Cody, the AI with the lowest difficulty. Still, it took me the better part of 20 minutes to force him into a stalemate. My initial complaint about the app is that it doesn’t give you a button to start it and doesn’t seem to show up in my installed extensions list. The only way I was able to launch it was to go to the Web Store, find it’s page, open the details, and click “Launch App”. It then opened a new tab and told me a bit about my opponents. If there is a button to launch SparkChess, it clearly isn’t obvious. 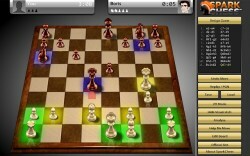 All in all, SparkChess seems worth it for the free version. I may consider upgrading to the paid version in the future, but for right now I think I’m going to see if I can actually win a game.